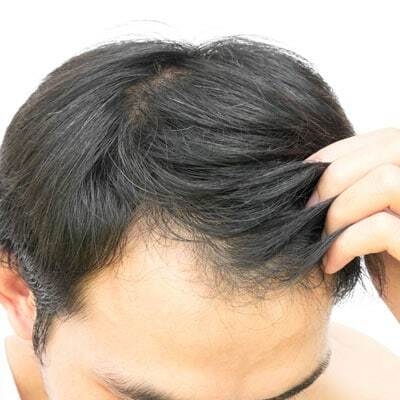 In 95% of all cases, men’s hair loss is androgenetic, hence hereditary. A specific enzyme transforms testosterone into DHT which will permanently stimulate the sebaceous glands. 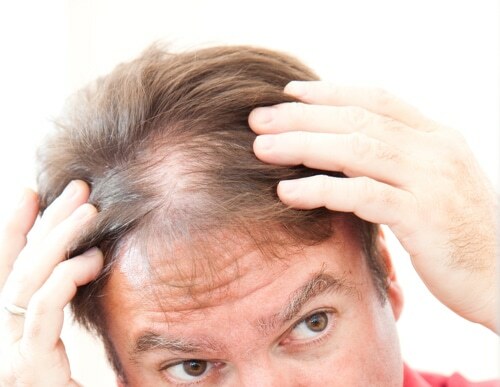 The excess oil obstructs the follicle in which the hair grows, and will ultimately suffocate the bulb. Based on Norwood OT: Classification and incidence of male pattern baldness; baldness progresses in several phases and over several years. It usually starts from frontal temporal recessions to the opening of the vertex until only a thin crown is left on the sides and the back of the head. The cycle of recession will accelerate under the influence of a poor diet, stress, medication or the use of certain products that leave residues on the hair. There is no miracle cure, but there are solutions to help balance your hair cycle and slow down the process. Products from the Capilia Advanced Scalp Care Line are made with 100% natural ingredients including African kigelia, sage and ginkgo biloba. Their purifying action has been scientifically developed for men’s hair and scalp. Use the Masculine Complex Shampoo in combination with the Masculine Complex Lotion from the Capilia Advanced Scalp Care Line. We recommend alternating with another shampoo from Capilia’s Natural Hair Care Ritual Line or Advanced Scalp Care Line.